It’s A Bulb and A Security Camera Screw it in just like a normal light bulb, this product can be used as a bulb and a security camera. 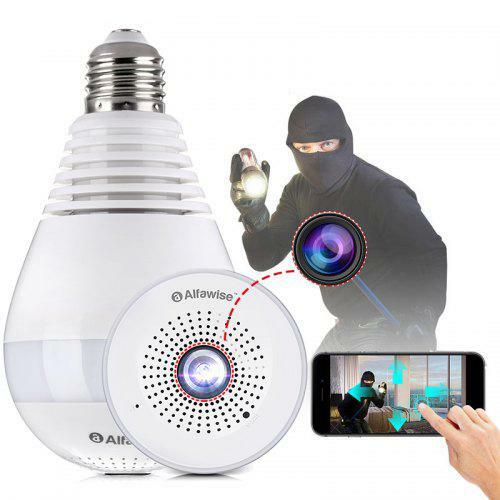 Looking like a normal LED bulb to others, it will secretly guard your home. 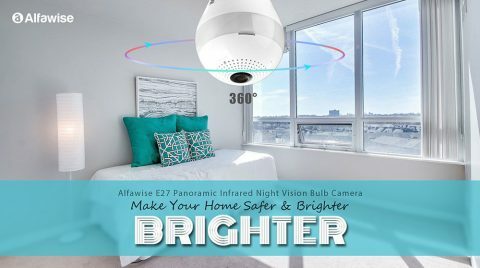 360° Panoramic Fish-eye Lens, No Blind Spot Built in fish-eye lens, this camera will provide you with 360 degree panoramic viewing angle without blind area! You can monitor the whole room (up to 400 square foot) with 1 single camera! Night Vision & Motion Detection You can see clearly even at night. When motion objects are detected, it will trigger alarm message notifications and auto send an email to your mailbox. Real-time Two-way Conversation With the built-in microphone & speaker, you can turn on the sound button to hear & press the talking button to talk in the APP.